The ninth day of the Get Back/Let It Be sessions was the second full one without George Harrison, who had walked out of Twickenham Film Studios on 10 January 1969. It was clear by this stage that The Beatles were unable to function in any meaningful way as a trio, and motivation and inspiration hit a low mark on this day. As with other Twickenham rehearsals, it began with Paul McCartney working alone at a piano, although there is little of the energetic enthusiasm which he brought to the earlier days. Once John Lennon and Ringo Starr had arrived, they performed a mix of improvised songs, golden oldies and original compositions, as had become customary in these sessions. One of the songs was Woman, the McCartney song given in 1966 to Peter & Gordon, which had the only known Beatles performance on this day. Another was The Back Seat Of My Car, later to be one of the highlights of McCartney's 1971 album Ram. A piano boogie duet featuring McCartney and Starr was included in the Let It Be film, and was copyrighted Jazz Piano Song by Apple. Of the other tracks, Madman and Watching Rainbows were Lennon compositions which was taken no further, although Madman was performed again at Apple Studios on 21 January. Lennon also played a brief version of You Know My Name (Look Up The Number), the still-unreleased song which The Beatles began recording in May 1967. This was followed by a discussion about the future. Let It Be director Michael Lindsay-Hogg asked if they should relocate the filming to EMI Studios and abandon the idea of a live show, but Lennon explained that any decisions should be made with Harrison, who was in Liverpool. The day ended with McCartney alone at the piano, performing Oh! Darling and a brief version of Ob-La-Di, Ob-La-Da, for Glyn Johns to test the audio equipment. On this day Lennon and Ono were also interviewed by a reporter from Canada's CBC-TV. It took place around midday and lasted for 30 minutes, and has since become known as the Two Junkies interview. 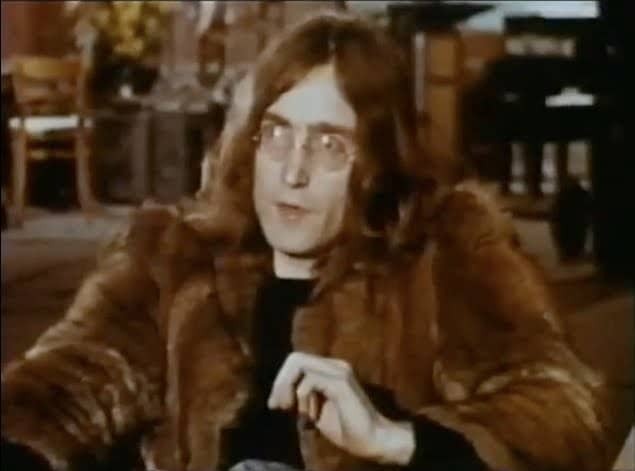 Lennon was clearly high on heroin during the interview, growing paler and more restless as it progressed. Eventually he said "Excuse me, I feel a bit sick" and the camera was turned off. The second half of the conversation was noticeably livelier, and Lennon discussed live performances, inspiration, and the couple's future plans. An extract from the Two Junkies interview was used in the 1988 documentary Imagine: John Lennon, in which Lennon discussed being counted both out and in on Revolution 1. The Beatles held a meeting on the following day, 15 January 1969, and agreed to Harrison's demands to move the sessions from Twickenham to Apple's headquarters in Savile Row, London. These began a week later, on 21 January, in higher spirits and willing to continue with the Let It Be project.